Ask the Advocate: ﻿How Can I Build a Support Network? 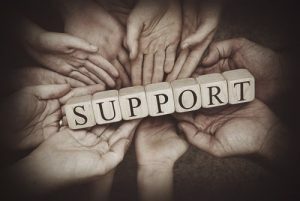 Home › News & Events › Recent News › Ask the Advocate: ﻿How Can I Build a Support Network? You ask, our advocates answer. This month our peer advocate, Suzanne, discusses the importance of having a community support network. A critical element of recovery is building a community to support us as we journey down this road of healing and restoration. A successful recovery requires us to connect and accept help from others. We cannot do recovery alone. The federal government through the Substance Abuse and Mental Health Services Administration (SAMSHA) has identified four dimensions that support a life in recovery. These four dimensions are health, home, purpose, and community. Today, I want to focus on community, which is defined as “having relationships and social networks that provide support, friendship, love and hope.” Our network enables us to be supported in many different ways by many different people for many different needs. Recently, I spoke with Sandy. She called the Peer Advocacy line feeling very lonely and bored with life. She asked what she could do to change this situation. Sandy is not unlike others who call our Warmline or Peer Advocacy line who feel too isolated. Reaching out to ask the question is the first step in creating community. So how could Sandy create her own community support network? We first discussed whether she was interested in having social connections with other people recovering from a mental illness. I identified a drop-in center close to where she lived that she could check out. A drop-in center is place that people living with a mental illness can go to socialize and participate in activities such as book clubs or cooking classes. Many drop in centers also provide other types of community support services, such as housing support and employment support. I asked her if she prefers connecting with others through similar interests? I told her about Meet Up, https://www.meetup.com, which is a large internet organization comprised of many different kinds of groups based on a shared interest, like playing board games or learning a new language. I said I knew this was a fast way to meet new people, because I have joined fun meetup groups, myself. Next we discussed whether she was interested in working one day. I mentioned how having a structured life when you’re employed can help with loneliness and boredom, and to push forward recovery. We discussed how volunteering can be a bridge to employment. We discussed her interest in various causes that could serve as a basis for selecting a volunteer opportunity. I referred her to https://www.volunteermatch.org, which is a website that matches volunteers with organizations. They have opportunities for all kinds of causes. And lastly, we discussed joining a support group. I discovered that she lives close to a Depression and Bipolar Support Alliance (DBSA) group, so I provided her with contact information. I also told her about Mental Health Minnesota’s peer-led Support Groups for Recovery and Wellness that are open to anyone who is experiencing a mental health struggle. I suggested online support groups if she is more comfortable connecting through the web. I also mentioned the Minnesota Warmline which provides social connection and support on the telephone. After our conversation, Sandy felt some relief and hope. She is going address her loneliness and boredom by starting to build her community support network. If you would like to talk about building your community support network, you can call Mental Health Minnesota at 651-493-6634, and schedule an appointment to speak with a Peer Advocate. This entry was posted on April 27, 2018 by Shannah Mulvihill.